Photo: Sadie indicating the hide at her NACSW NW1 trial, vehicle search. Copyright 2012 Olga Maderych. All rights reserved. 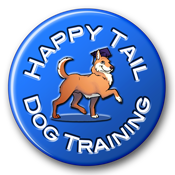 Happy Tail Dog Training LLC (HTDT) will make an effort to ensure that clients receive the number of classes advertised in the course descriptions for group classes and the number of private training sessions agreed upon. However, it may be necessary to cancel classes or private training sessions at times due to unforeseen circumstances, such as weather. For weekdays, HTDT classes and private training sessions (including behavior modification consultations) will be cancelled when Baltimore County or Harford County schools are closed for the day due to inclement weather or if they have an early dismissal due to snow, sleet, high winds, etc, excluding heat and heat index. Click here for school status: Baltimore County Schools: Closings, Delays, Cancellations, & Postponements and Harford County Schools: Inclement Weather and School Closings. If HTDT believes that the schools have been over cautious in closing and wishes to hold classes or private training sessions, clients will be contacted to advise them of those intentions. HTDT will attempt to schedule make-up sessions for any group class cancelled, keeping in mind that if there are a large number of cancellations, rescheduling may not be possible before the start of the next session. HTDT will also attempt to schedule make-up sessions for any private training class cancelled, keeping in mind that there may be a delay of a week or two before another open spot on the calendar is available. HTDT does not have a heat or heat-index cancellation policy. If HTDT believes the heat or heat index is so excessive so as to create an unsafe situation, group classes may be cancelled and students notified accordingly. Happy Tail Dog Training LLC is located in Phoenix MD. Colleen is available for private coaching and training sessions as well as canine behavior modification consultation sessions at the trainers facility in Phoenix as well as at the client's home. HTDT's service area includes Baldwin, Cockeysville, Fallston, Fork, Glen Arm, Glencoe, Hunt Valley, Lutherville-Timonium, Montkon, Parkville, Phoenix, Sparks, Towson. For any areas located outside this service area, a travel fee will be required in addition to the regular service fee.